That’s what another birder told us just after we arrived at the Smith Oaks Sanctuary at High Island. I was barely able to process all the Roseate Spoonbills, Snowy and Great Egrets sitting on all the trees at the rookery as if Christmas ornaments spaced purposely on protruding limbs. 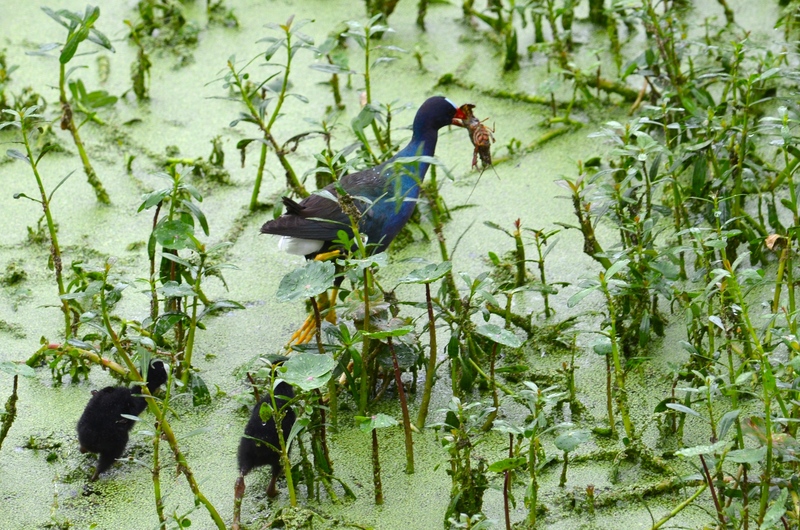 And a Purple Gallinule too? I thought. It was just almost too much. 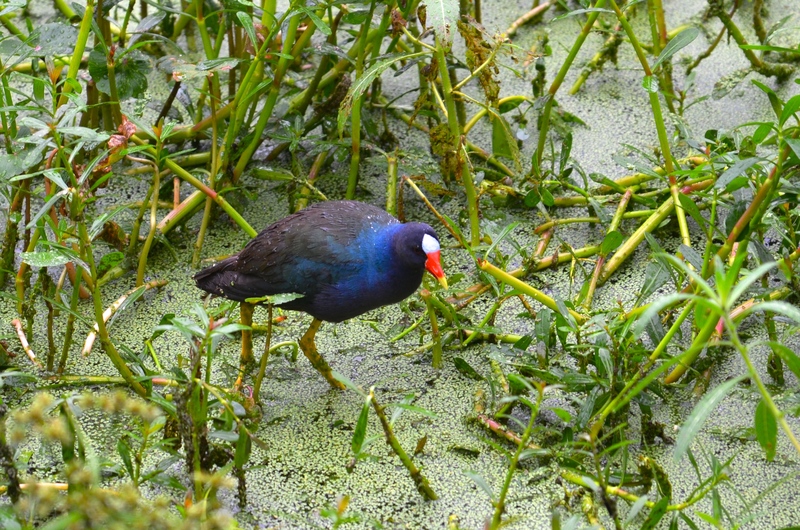 I missed seeing the Purple Gallinule when we were at the Everglades last November, though others we met while birding said they saw it. I hate days like that when everyone else seems to have seen the bird but you. And we saw one in Belize, but it was just a speck in the distance. But this day at Smith Oaks was going to be my lucky day. 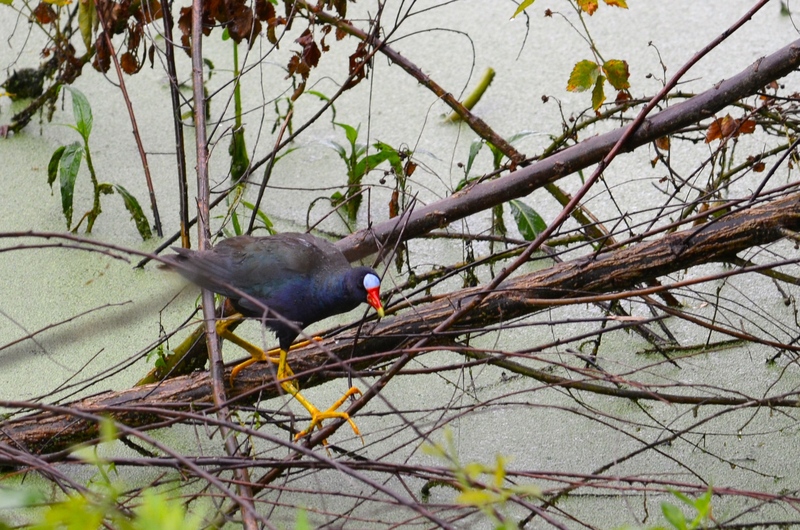 Besides the striking colors and the candy corn beak, the Purple Gallinule has giant arachnid-like yellow feet. 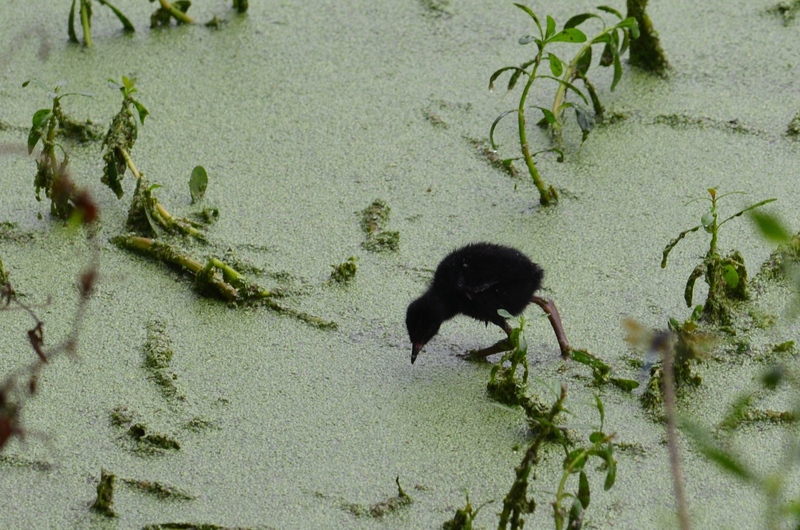 And cute little black fur ball chicks who scout around the pea soup swamp looking for bugs to eat. When the adult was nowhere in sight I heard its hen-like kek-kek-kek. She was calling her chicks who popped their heads up to see where she was. And then out of the bushes from the left she comes, lickity-split toward her chicks who then follow momma who has caught a nice juicy crawdad for lunch. I’m impressed by her excited speed toward her chicks, their exuberance in following mom (of course—food! ), as well as her ability to call to her chicks with food in her mouth. Not only is she beautiful, but she’s also a ventriloquist. Yes, I missed the Purple Gallinule in Florida, but Texas has once again come through for me. And it taught me why I love birding: I just love watching these little vignettes play out. We are like birds. Birds are like us. We all come running when someone brings us food. Those feet are indeed awesome. Thanks!